There is a deeply spiritual side to my veganism, one that feels natural and harmonious with the original vision of Eden and the ideals of Christianity. If you bless an animal, does that mean it has a soul, and if it has a soul, does that mean you shouldn’t eat it? “Do I think I’ll meet my animals in heaven?” Bishop Daniel pondered. “Surely they’ve made sacrifices and given us great joys. I can’t imagine that their sacrifice goes unnoticed by God.” What "sacrifice" is Bishop Daniel referring to? I realize you're just trying to be funny and that it's trendy to mock vegans, but many of us see nonhuman animals as fellow brothers and sisters in Christ and in doing so, we choose not to exploit, abuse, and murder them. These messages are not harmless and support a speciesist and abusive belief system that promotes ill will toward other living beings. You would not make light of hurting a cat or dog, yet you do make light of hurting and killing cows, who are no different. I prefer to live a life that doesn't impose unnecessary suffering on others. I can't understand how any person or organization, especially a church, chooses to do otherwise. Thanks for your feedback on our sign . . . 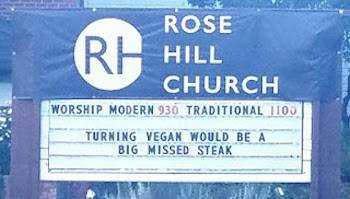 I don’t think our sign guy realized it’s trendy to mock vegans. I know I didn’t. Regardless, we apologize for our insensitivity. It certainly wasn’t our intent to offend anyone but simply have fun with words. We will be more sensitive about these kinds of things in the future. Thanks again. Thank you for your thoughtful response. I care less, however, about any insensitivity to vegans than I care about what the message means for the treatment of other animals. Any offense I took pales in comparison to the offenses committed daily against those nonhumans who have the hopeless misfortune to be labeled "food" or "steak." Through abject violence, these living, feeling beings are turned into commodities. We pay slaughterhouse workers to do our bidding and to carry out our dirty work. It's something we like to forget. The message on your sign was just another attempt to trivialize and distance ourselves from our contribution to needless cruelty and exploitation. We like to say we love animals, but we don't. Sadly, our actual behaviors rarely live up to our spoken values. Every year around the feast of Saint Francis of Assisi (Oct. 4), many churches hold a special service to "bless the animals," opening their doors to both parishioners and their pets. This year, nonhuman visitors to the Cathedral of St. John the Divine in Manhattan included a large tortoise, horse, cow, and camel, among many others. "If you bless an animal, does that mean it has a soul, and if it has a soul, does that mean you shouldn’t eat it?" asked photographer Dina Litovsky, who took photos of the event for the New York Times. Litovsky, who eats flesh occasionally, admitted to a "conflicted relationship with meat." Most humans are raised as speciesists and taught to believe that other animals are inherently inferior. It is not surprising, therefore, that their love for some nonhumans raises moral concerns about their eating others. Bishop Clifton Daniel, dean of the cathedral, replied cavalierly to these genuine concerns: "Yes, animals and all living things carry some aspect of God's image. And no, this did not preclude eating them." What the bishop fails to acknowledge is what has to transpire for nonhuman animals to be turned into consumable merchandise: a lot of awful and disturbing things that he and very few others care to admit or acknowledge as they casually sit down to eat them. Furthermore, eating the flesh, milk, and eggs of other animals is unnecessary for optimum human health, so this captivity, pain, and death we subject other animals to is completely gratuitous and self-indulgent. How can our voluntary contribution to such avoidable bloodshed be pleasing to God? Or to us, for that matter? In his scholarly work, Disciples: How Jewish Christianity Shaped Jesus and Shattered the Church, Keith Akers examined the movement that preceded Jesus and formed both him and his disciples. The Ebionites and Nazarenes rejected war, wealth, and animal sacrifices, while espousing simplicity, nonviolence, and vegetarianism. "Vegetarianism was more than just an optional way to self-improvement," wrote Akers; "it was a necessity for Godly living." Despite the injection of fish into certain passages of the Gospels, there is strong evidence that both Jesus and his brother James were vegetarians, as well as John the Baptist, who most likely did not eat insects (locusts) but locust beans from the widely available carob tree, also known as St. John's bread. In spite of heartfelt intentions, the "blessing of the animals" is performed for the benefit of parishioners and the church; it is not carried out in the best interests of their nonhuman friends, who probably prefer to remain "home" or in their natural habitat than be transported to and paraded around an unfamiliar and unsuitable place that's loud and filled with strange smells and faces. (See photo of the poor tortoise on the cart.) I imagine this experience is traumatic for most of them. But what about the millions of nonhumans trapped in cages of their own filth and excrement, who are sick and filled with fear, waiting to be slaughtered? Who thinks of them? What are churches and their parishioners doing for them? If you ask most people whether it's generally acceptable to unnecessarily hurt other animals, they would answer "no, it is not." Yet, that is exactly what they do every day. For now, it's still socially acceptable to manipulate the reproduction of nonhumans for their eggs and milk and slaughter them for their flesh, so we rarely question it. This indifference ensures that some nonhumans remain outside our moral and social purview. But whether we concede to our participation in such atrocities against other animals, we still bear moral responsibility for them. The "blessing of the animals" is indicative of our attempts to rationalize our self-contradictory beliefs—our claim to "love animals" even while we continue to oppress them. Instead of being honest with ourselves, we excuse our cruel choices and delegate the gruesome task of killing to others. What "sacrifice" is Bishop Daniel referring to? The sacrifice of domestication, the sacrifice of their bodies and their lives? His comment sounds primitive, like something a nineteenth century Southern plantation owner might have said about his slaves. One thing is certain, however. Nonhumans do not willingly "sacrifice" their lives for our use—their lives are taken. Anyone who is willing to confront what takes place in a slaughterhouse will discover that the individuals who are dragged into these factories of death fight very hard for their lives. If anything, I believe their entry into heaven is more assured than our own. But the bishop is right about one thing. I don't believe these "sacrifices" go unnoticed by God. In Luke 12:6, Jesus reminds us, "Yet not one sparrow is forgotten by God."